YOGA ACCESSORIES There are 8 products. 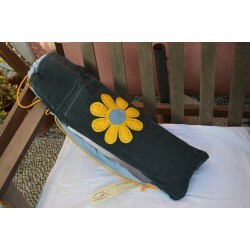 Fitness Bag-Blue-Yellow Daisy-Large. It is made from a man’s dark blue jeans trousers, decorated with a light blue checkered flannel fabric, with yellow details (strap – daisy). A strap with a string allows for hanging over the shoulder or place on a hanger. 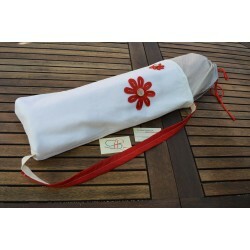 Bag/Case for exercise mat-Corduroy/Ivory-Beige/Polka dot-Red Daisy. It is made of ivory-female corduroy trousers and decorated with beige polka dot cotton fabric, with red details (strap - daisies). A lined strap placed on the back side allows for hanging over the shoulder or place on a hanger. 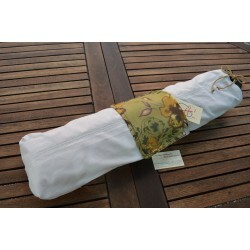 Bag/Case for exercise mat-Olive Green/Velours- Yellow/Green printed Silk. It is made of olive-green female velours trousers and decorated with printed silk cloth, with yellow & green details. A lined strap placed on the back side allows for hanging over the shoulder or place on a hanger. 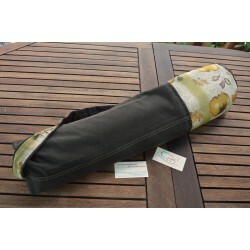 Bag/Case for exercise mat-Olive Green/Velours- Military/Ivory. It is made of olive-green female velours trousers and decorated with military printed cotton cloth, with ivory background. A black strap placed on the back side allows for hanging over the shoulder or place on a hanger. 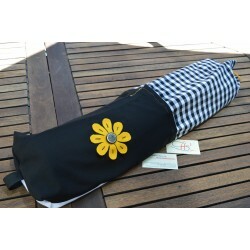 Bag/Case for exercise mat -Black/Elastic-Checkered-Yellow Daisies. 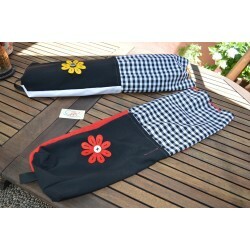 It is made from a female black elastic trousers, decorated with a black & white checkered cotton fabric, with yellow details (string – daisies). A black strap placed on the back side allows for hanging over the shoulder or place on a hanger. 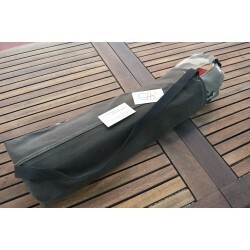 Bag/Case for exercise mat -Black/Elastic-Checkered-Red Daisies. It is made from a female black elastic trousers, decorated with a black & white checkered cotton fabric, with red details (string – daisies). A black strap placed on the back side allows for hanging over the shoulder or place on a hanger. 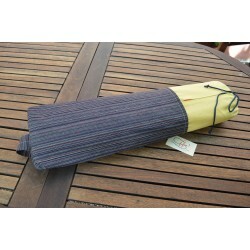 Bag/Case for exercise mat –Blue-Striped/Elastic- Yellow/Linen. It is made from blue striped elastic fabric, decorated with a yellow linen cloth from a female skirt & a blue stripe on the top for closing. A blue striped strap placed on the back side allows for hanging over the shoulder or place on a hanger.